July 28, 2008, is another date he’ll never forget. Ameen was serving as a hospital corpsman in Afghanistan when, while rushing to assist an injured Marine, he stepped on an improvised explosive device and lost the lower half of his left leg. Like thousands of other soldiers with similar experiences, Ameen dealt with post-traumatic stress after the incident. According to the U.S. Department of Veterans Affairs, of those who served in operations Iraqi Freedom and Enduring Freedom, between 11 and 20 percent have post-traumatic stress disorder (PTSD) in a given year. That’s anywhere from 275,000 to 500,000 people, and it doesn’t include veterans of other wars. Though progress has been made toward understanding and treating PTSD, there still remains a lack of sufficient resources for those seeking help. Those were the findings of students in Arizona State University professor James Shraiky’s course on current issues in health design, in the Herberger Institute for Design and the Arts. 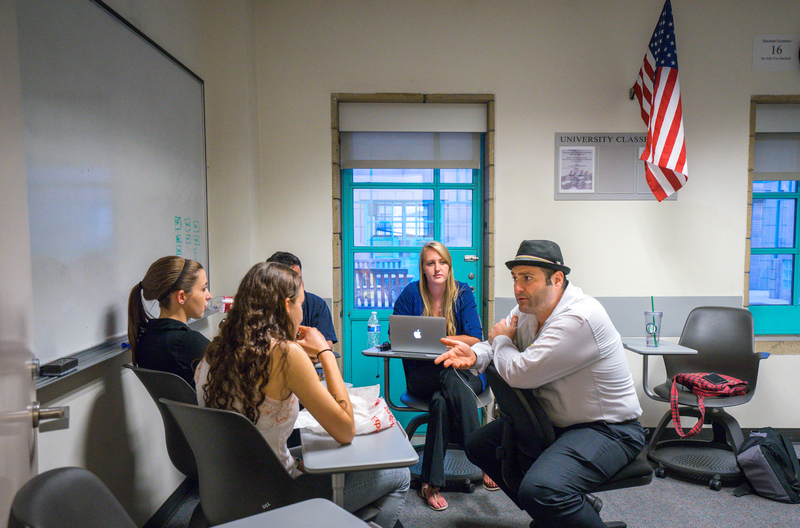 The students worked with non-profit organization Wings for Warriors, which Ameen founded, to interview veterans with PTSD (or, as they call it, PTS, preferring not to call it a “disorder”) and get feedback on their experiences with various health-care systems. The collaboration came about when Shraiky – who for the past three years has been conducting research on long-term strategies to help vets cope with PTS – mentioned to a colleague that he was looking for a non-profit to work with for one of his classes. That colleague happened to know Ameen. Biological sciences undergrad Alexandra Bohnenberger, a student in Shraiky’s class, said the class’ goal was to find gaps in veterans’ health care and see how to improve it. “We listen to veterans’ voices and see what exactly the problem is when they come back; why their PTS is developing, what’s making it worse, what could make it better,” she said. The students worked with Wings for Warriors to find veterans willing to speak with them on phone interviews. Afterward, they analyzed their responses using a “system map” that followed a timeline of events from when the veteran enlisted to the present day in order to identify when the “gap” in sufficient support occurred. What they found was that the majority of the vets they spoke with had the most issues during the “reintegration” phase, readjusting to civilian life. The cause of that, they discovered, was a lack of resources. At that point, their focus shifted. That’s also the goal of ASU’s new Center for Veterans’ Wellness, which conducts research and helps vets affected by combat-related stress and trauma. The center was established early in 2015 to draw together experts from a variety of disciplines across the university and its partner organizations to expand their work and develop new ideas. On April 28, students from Shraiky’s class will present their findings at a panel discussion where such organizations as Healing Arizona Veterans, the Pat Tillman Foundation, American Veterans for Equal Rights and others will be in attendance. The event takes place from 6 to 9 p.m. at the SRP Pera Club, 1 E. Continental Drive in Tempe. It is free and open to the public. To learn more about Wings for Warriors, visit www.wingsforwarriors.org. More information is available on the organization’s Facebook page and Twitter feed. Expressions of suicidal thinking or intent should never be ignored. But what happens when a message of desperation is lost in the noise of internet chatter? Two facts drove the creation of ARKHumanity: In the U.S., one person dies by suicide on average every 13.3 minutes, and the incidence of suicide lowers when someone takes an empathetic interest and cares about a person’s well-being when he or she is in crisis. ARKHumanity extends this effort further by connecting people to resources such as a lifeline chat or hotline. 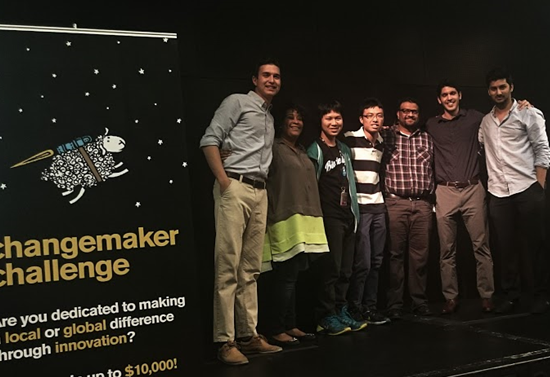 The $10,000 prize from Changemaker Challenge will significantly help the project by covering server costs, legal expenses and conference presentations to introduce it to local, state and national organizations. The group's goal is to make the technology available to select mental-health professionals by October 2015 and to update the technology as necessary to be able to expand response capacity. Ultimately, the team wants to develop an impactful platform that can be adopted by mental-health organizations locally and globally. Kelli Donley, project manager and suicide prevention coordinator for the Arizona Department of Health Services, is a community supporter of the project. “This technology is greatly needed to identify the warning language often used as cries for help before suicide attempts," Donley said. "Using social media to identify suicidal ideations is a creative idea that should be supported." ARKHumanity was conceived in September 2014 at the Hacks4Humanity hackathon, a 36-hour event co-sponsored by ASU Project Humanities and EqualityTV. The goal of the program was to engage creative thinkers, artists, programmers, designers and anyone interested in creating technologies for the greater good. The five-member team of ASU graduate and undergraduate students and community members came from varying backgrounds. They had never met beforehand and worked together over the two-day period to develop a working prototype of the innovative technology. They also won first place in that competition. Under the guidance of faculty mentor and Project Humanities director Neal Lester, the team entered the Changemaker Challenge in November. The team says it’s important to include the humanities when trying to solve social problems, and believes outreach cannot be automated and still have the same positive effects. Ultimately, people will be needed to review a flagged tweet to verify it needs a response, and then separate, trained responders to do the outreach from existing partner organizations. Jordan Bates is a doctoral student at ASU in the Applied Mathematics for the Life and Social Sciences program. He is working with the Center for Policy Informatics and was a fellow at Data Science for Social Good in 2013. He received his B.S. in computer science from Purdue University. Bin Hong Lee is an undergraduate student at ASU majoring in software engineering. He has served as a judge for the First Lego League series in 2014 and is a former member of the Global Shapers Community Georgetown Penang. Pat Pataranutaporn is a first-year student majoring in biological sciences at ASU. He is a researcher at the Swette Center for Environmental Biotechnology and a member of the Gifted Young Scientist Society. Ram Polur is an epidemiologist at the Office of Cancer Prevention and Control at the Arizona Department of Health Services. Ram has bachelor's in biology with a minor in biochemistry, a bachelor's in computer science with a minor in applied physics, and a Master of Public Health. Kacie McCollum is the doctoral chair for the School of Advanced Studies and a faculty member for the College of Humanities and Sciences at the University of Phoenix. She is also the CEO of Shiny Bird Farms. She received her bachelor's in political science from Benedict College and her master's and doctor of education in STEP/curriculum design and instruction from the University of Massachusetts-Amherst.